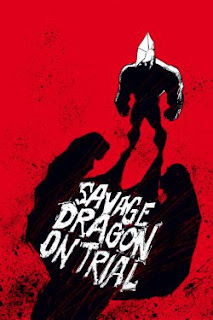 The Fellowship was fortunate enough to obtain a copy of SAVAGE DRAGON #184 from Image Comics. Erik Larsen writes and draws. Dragon has managed to get himself back to normal (relatively speaking), but now is having to deal with the aftermath of his “possession.” A lot of damage has been done, and even though he’s got lots of people ready to vouch for him, he was the weapon. This case will certainly go to trial, and Dragon might not win this fight. This was a very “talky” issue—lots of exposition. But that’s because the last one was pretty much all action, so this one balances it out. It gives some good insight as to where many characters stand in regards to what happened to Dragon, which is important stuff. Both in the story and for the story; it shows some depth in the characters, which always adds to the appeal of the title. It’s not all about the punching, and I for one am glad that Larsen gets that. This is one of the granddaddies of creator-owned titles, and it’s no surprise to me that it’s still around. There’s some really good writing here, and the art’s nice too. You can’t go wrong with this one. SAVAGE DRAGON #184 is available now at your FLCS or by order from imagecomics.com.